Philips adds touchscreen and HDMI output to GoGear Muse | What Hi-Fi? The Muse now comes in a svelte, silver casing and packs in an HDMI output for viewing 720p, HD videos on your TV. 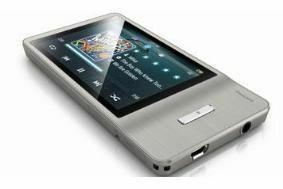 There's a 3.2in, 480 x 320 resolution touch screen, a microSD card input and even an FM radio. File format compatibility has been improved, with FLAC and APE lossless now supported alongside the usual MP3, WMA, AAC and WAV formats, amongst others. It's also compatible with downloaded BBC iPlayer files and the Napster To Go service. Available in 8, 16 and 32GB models, the GoGear Muse will cost £100, £130 and £180 respectively.